2. any substance that inhibits growth of microorganisms; this is contrasted to a germicide, which kills them outright. The category antiseptics is also not considered to include antibiotics, which are usually taken internally, although it does include disinfectants. However, most disinfectants are too strong to be applied to body tissue and are generally used to clean inanimate objects such as floors and bathroom fixtures. Antiseptics are divided into two types: physical and chemical. The most important physical antiseptic is heat, applied by boiling, autoclaving, flaming, or burning. These are among the oldest and most effective methods of disinfecting contaminated objects, water, and food. Chemical antiseptics have many applications: they are used in treating wounds and infections, in sterilizing (such as before an operation), and in general hygiene; they also have applications in the preservation of food and purification of sewage. There are many different antiseptic substances to choose from; their strength and the speed at which they work are factors that influence the choice of which to use for a specific task. urinary antiseptic a drug that is excreted mainly by way of the urine and performs its antiseptic action in the bladder. These drugs may be given before examination of or operation on the urinary tract, and they are sometimes used to treat urinary tract infections. (an'ti-sep'tik), Do not confuse this word with aseptic. 2. An agent or substance capable of effecting antisepsis. 2. preventing decay or putrefaction. 3. a substance that inhibits the growth and development of microorganisms without necessarily killing them. a. Capable of preventing infection by inhibiting the growth of infectious agents. b. Devoid of infectious agents; aseptic. c. Of or associated with the use of antiseptics. a. Devoid of enlivening or enriching qualities: "This is ... not at all lighthearted or amiable music. In fact, the tone is unremittingly sober and antiseptic" (Donal Henahan). b. Free of disturbing or unpleasant features; sanitized: an antiseptic version of history. A substance that prevents infection by inhibiting the growth of infectious agents. 1 tending to inhibit the growth and reproduction of microorganisms. 2 a substance that tends to inhibit the growth and reproduction of microorganisms when applied to living tissue. See also disinfectant. A herb that is used internally or externally to either prevent the breakdown of tissues by microorganisms or inhibit their growth; herbal antiseptics include barberry (Berberis vulgaris), coneflower (Echinacea augustifolia), eucalyptus (Eucalyptus globulus), garlic (Allium sativum), goldenseal (Hydrastris Canadensis), horseradish (Cochlearia armoracia), myrrh (Commiphora myrrha), St John’s wort (Hypericum perforatum) and white pond lily (Nymphaea odorata). adjective Referring to an agent or effect that counters microbial growth noun Medtalk A substance that arrests or prevents the growth of microorganisms by inhibiting their activity without necessarily destroying them. Cf Aseptic, Disinfectant, Germicide. 1. Pertaining to, or able to produce, ANTISEPSIS. 2. Any substance capable of killing infective micro-organisms. literally, a substance that counteracts purification (Greek septos, meaning putrid); more normally, a substance that prevents infection in a wound. Antisepsis is carried out by DISINFECTION or STERILIZATION using non-toxic, non-injurious substances, and has the effect of killing or inactivating microorganisms which cause infection. An antiseptic is used on living things, such as body tissues. This compares with a disinfectant, which is used on non-living things. Chemicals applied to the skin to destroy bacteria and prevent infection. The choice of antiseptic will be determined by the circumstance in which it is used. n/adj a substance that controls infection by inhibiting growth and replication of the causative agent. (an'ti-sep'tik) Do not confuse this word with aseptic. n an antimicrobial agent for application to a body surface, usually skin or oral mucosa, in an attempt to prevent or minimize infection at the area of application. 2. any substance that inhibits the growth of bacteria, in contrast to a germicide, which kills bacteria outright. 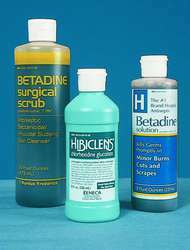 Antiseptics are not considered to include antibiotics, which are usually taken internally. The term antiseptic includes disinfectants, although most disinfectants are too strong to be applied to body tissue and are generally used to clean inanimate objects such as floors and equipment. Includes physical antiseptics, chemical antiseptics, halogens, alcohols and surfactants. a drug that is excreted mainly in the urine and performs its antiseptic action in the bladder. These drugs may be given before examination of or operation on the urinary tract, and they are sometimes used to treat urinary tract infections. IF baby's very young, sterilise the spoon by boiling it or placing it in a sterilising solution. Wipe with a sterilising solution, dry naturally, then wipe lightly with vegetable oil. There are several sterilising solutions available to kill and remove the spores.